It’s joining the ranks of other fermented food like yoghurt, kimchi and sauerkraut — all probiotic powerhouses touted for their benefits to gastrointestinal health. While it may not have the star power of Greek yoghurt yet, a kombucha craze may soon take hold. 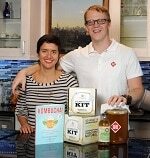 That’s thanks in part to Eric and Jessica Childs, the husband-wife team from Prospect Heights behind Kombucha Brooklyn. Since 2007, their kombucha blends like Straight Up, Red Ginger and Lemon Drop have been sold in bottles and on tap at New York’s food markets and grocery stores. As business began to boom, Eric and Jessica found themselves with a lot of extra ‘buch on their shelves, so they started cooking with it. Their new book “Kombucha!” – on sale November 5 and available for pre-order on kombuchabrooklyn.com – is chock-full of recipes starring the sweet, cidery and slightly fizzy beverage as a salad dressing, braising liquid, cocktail mixer and more, as well as instructions for how to brew your own ‘buch at home. In the holistic health world, kombucha’s potent combo of tea, sugar, yeast and bacteria has been credited with boosting immunity, improving digestion and relieving skin problems, and both Childses say they’ve benefited. Eric suffered from heartburn and adult acne in his 20s, while Jessica, a microbiologist with a certificate from the National Gourmet Institute, had developed a painful “yucky gut” from years of travelling and eating abroad. Those issues cleared up after brewing and drinking kombucha on a regular basis.